I've been using Aba Search And Replace for just three hours now, and already I have saved, quite easily, 20-25 hours worth of work I would have had to do without the use of your program. I really appreciate you for creating such a simple and useful tool. This is a very well-written search / search-and-replace utility. Lean, exceptionally fast, easy to use. This was one of those utilities that I don't normally need, but after checking out the website and features, even though there are freeware offerings, this was well worth the purchase just to have available. The incremental search speed is astonishing. Replacing text in several files used to be a tedious and error-prone task. 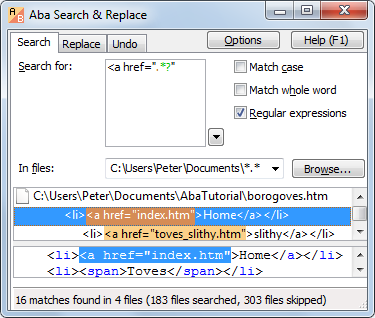 Aba Search and Replace solves the problem, allowing you to correct errors on your web pages, replace banners and copyright notices, change method names, and perform other text-processing tasks. Incremental search: the results are displayed immediately as you are typing the text to search for. Regular expression support including lookaround, non-greedy matching, and other advanced features. Replace in Unicode files (UTF-8, UTF-16). Preview before replacement: other tools require confirmation for each replacement, while Aba shows the list of replacements in context. You can review the list and confirm the changes at once. Syntax highlight for regular expressions, HTML, CSS, JS, and PHP files. Integration with Windows Explorer and Total Commander. Context-sensitive help, references and tutorial included. cleaning the output of an automated conversion tool (for example, a PDF to HTML converter). renaming a class, method, or function and even adding or removing method parameters. German, Italian, and Spanish translations are available. I'm looking for people who can translate Aba into other languages (especially French).